Come down and take part in daily Induction Weekend events commemorating the Class of 2017. Visit shop.hhof.com for exclusive Induction merchandise. See below for weekend schedule and stay tuned to HHOF.com as more events are confirmed. Partake in a special Q & A session featuring the 2017 Player Inductees - Andreychuk, Goyette, Kariya, Recchi and Selanne. Note: Due to anticipated attendance, seats for the fan forum are on a first-come, first-served basis. Inductees will not be available to sign autographs. at the 2016 Fan Forum. Click to enlarge. 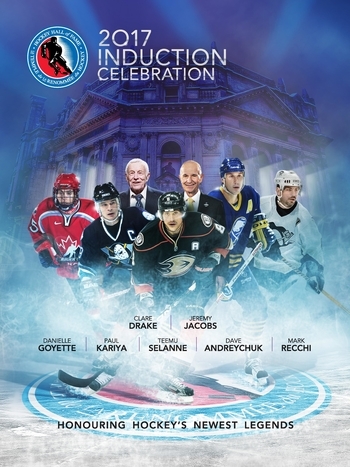 Hockey icons Mark Messier and Jari Kurri captain two star-studded teams in this annual classic featuring a pre-game ceremony honouring the Induction Class of 2017 &dash; Andreychuk, Drake, Jacobs, Goyette, Kariya, Recchi and Selanne. PRE-GAME CEREMONY &dash; Witness hockey history as the Induction Class of 2017 will receive their Official Honoured Members Blazers at centre ice. FREE SOUVENIR PROGRAM &dash; Upon entry to the game, each ticketholder will receive a complimentary souvenir collectible program. Messier, Kurri, Anderson, Andreychuk, Bourque, Ciccarelli, Goyette, Hawerchuk, Heaney, Howe, Kariya, Larionov, Murphy, Recchi, Selanne, Stastny, Stevens, Trottier, Antropov, Biron, Bondra, Broten, Clark, Elias, Giguere, Iafrate, Kaberle, Nicholls, Richards, Roenick, St. Louis and others. Star-Studded Rosters. 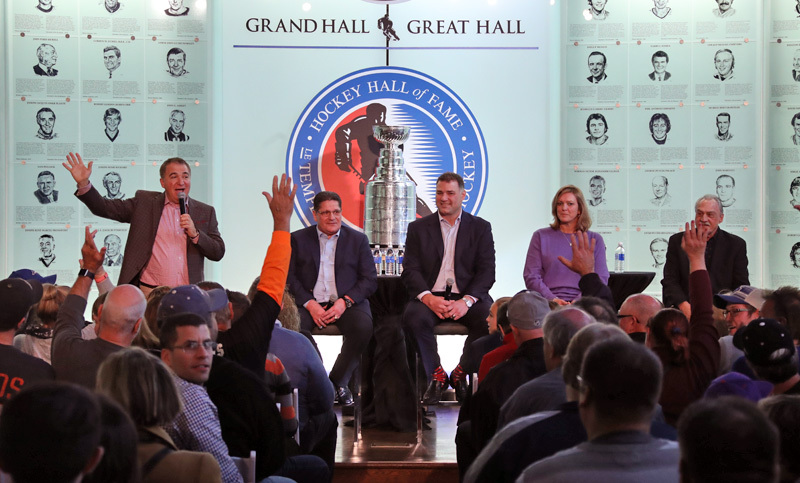 Rub shoulders with the legends and the who's who of hockey. Click here for Induction Celebration Gala details and ticket information. Click here to view the printable PDF Induction Celebration Gala brochure. otherwise noted and are subject to change without notice. plus other special promotions and perks by signing up for HHOF Teammates.